A year of your life is 7 to your dog. And a year in the digital marketing world sometimes feels like 7, especially if you’re trying to follow all the social media marketing trends. Just ask your social media marketing team whether they remember when the Cambridge Analytica scandal occurred. With all the chaos that happened during that time, most of them will tell you it happened in the ‘stone’ age. When in reality, it only happened at the beginning of the previous year. The thing is, social media marketing trends are moving with the speed of light. And all those social media marketing changes that marketers experience may give them the feeling that one year lasts much longer. The past year felt like this, in particular. We’ve witnessed pretty big things worth mentioning. And we can say that this was the year dedicated to social media users and improving their overall user experience. We are a team of firm believers that in the year that follows, 2019, this will continue to be a practice. 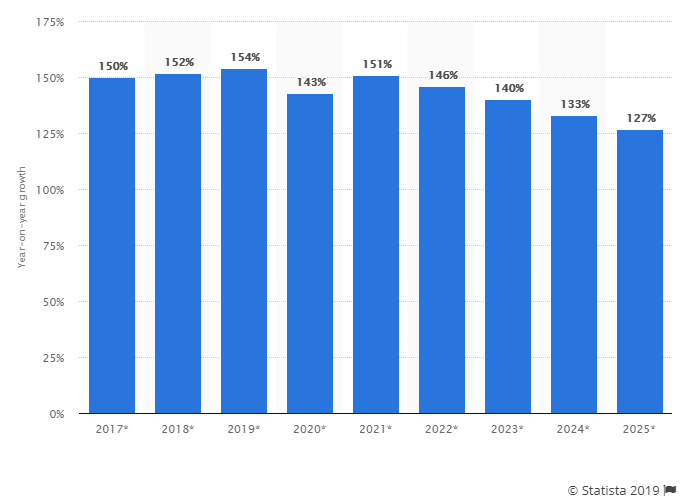 Without further delay, here are the social media marketing trends of 2018 and expectations for 2019. Let’s start with the social media marketing events that were a real kick in the teeth for any marketing team. These two following events triggered many of the social media marketing trends that happened in 2018. Let’s take a closer look at these events. 11 days into 2018 and businesses and social media marketers got the news of the year: the CEO of Facebook, Mark Zuckerberg, posted a status explaining that Facebook algorithm will endure changes. In short, the algorithm will be more focused on posts from close friend and family rather than public content. And yes, many businesses faced the negative consequences of this decision. Then it was Twitter. If you are a consistent Twitter user, you’ve probably noticed that around July 2018 the number of your followers drastically dropped. Twitter erased around 70 million fake accounts or 6% of overall Twitter users. The reason – as it was said in their statement, the number of followers on Twitter is an important thing, and the people behind the app want to make sure that those numbers are accurate. Perhaps one of the biggest events of the previous year that became a social media marketing trend was the GDPR regulation or in other words, improving the control over the personal data for any Internet user. Starting from May 25th, the regulation became legitimate and is expected from all organizations to be GDPR compliant. All of the mentioned events, more or less, changed the course of action for social media users in 2018. Social media marketers needed to adapt their social campaigns to the latest social media update, and employees needed to develop a legitimate GDPR policy, and that takes time. But these events are not alone on the social media marketing trends list of 2018; they are just at the top of it. With the rise of social media, it was inevitable that the same happens with social messaging apps. However, no one expected for the apps to grow this big. 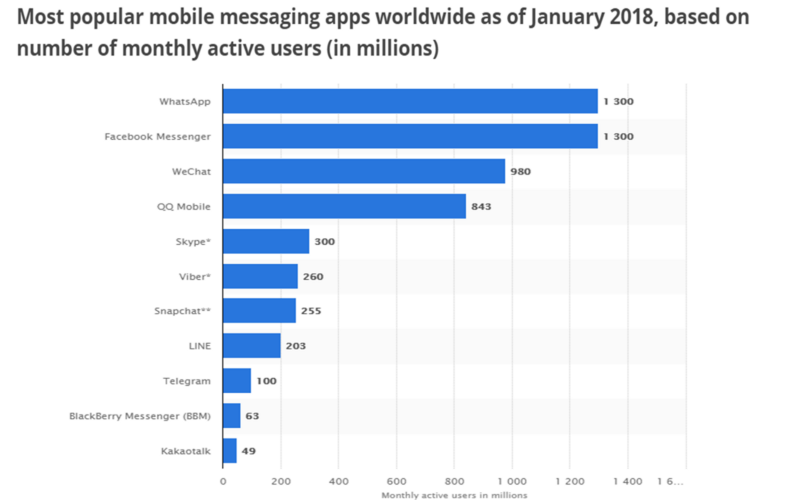 The number of social media messaging users in 2018 has risen significantly. This might be just a bunch of numbers for you, but these are terrific insights that could be used for developing a new branch of social media marketing strategy. Unfortunately, most businesses are still reaching out to users solely through social networks rather than social messaging, but hopefully, these numbers will change their perspective. If social messaging wasn’t a part of your strategy in 2018, it is never too late to implement it. You can check this proficient infographic from Twilio and collect even more info on this social media marketing trend. That being said, one-to-one communication wasn’t happening only on messaging apps but in other places like Instagram stories, for example. Instagram was the place to be when it comes to social media marketing trends of 2018. 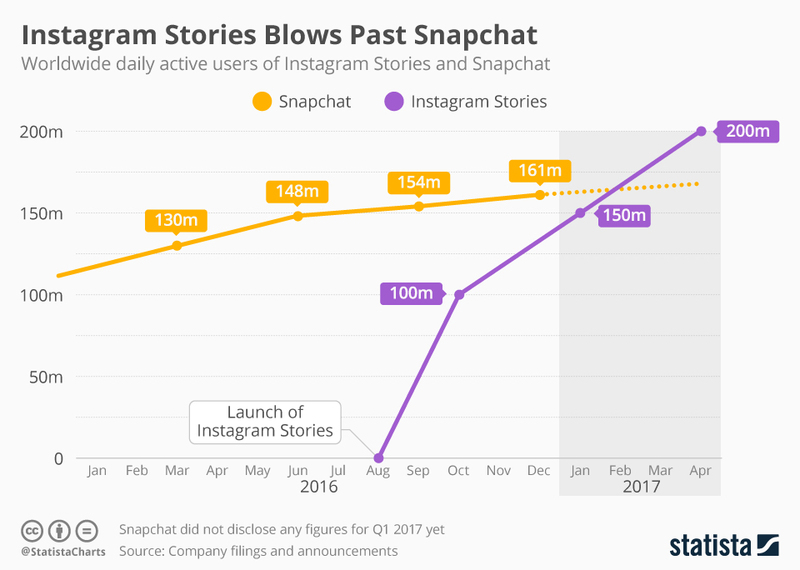 There are around 1 billion registered users on the app and a quarter of them are daily active users of Instagram Stories. Not bad at all for a feature that’s been on the market for only two years. It has successfully beaten Snapchat to the punch. This feature proved to be a great success, and as a result, Instagram launched a new feature on Instagram Stories – Shopping in Stories. Now the user has an option to click on five items on a photo and see details about the product in their stories. So, every time the user is watching a story from their favorite brand, they can check out the look and buy it. The ‘link in bio’ feature is long gone as this is an easier and faster way for businesses to interact with users. 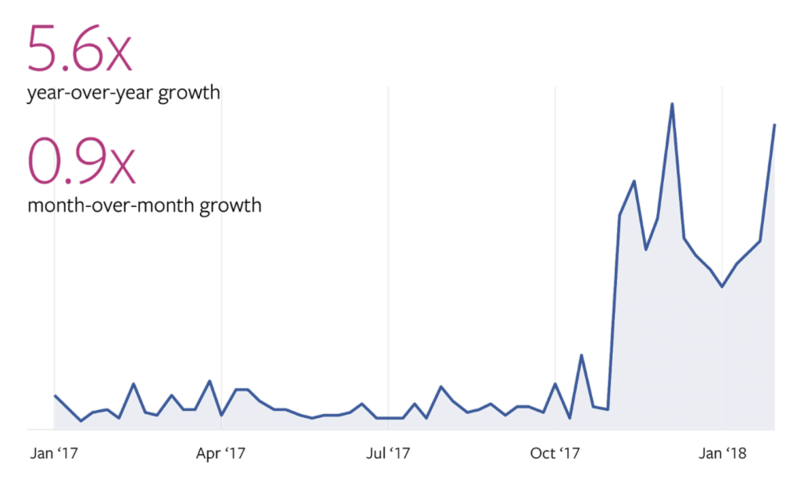 In 2018, the use of video content really hit the charts. It became one of the most popular social media marketing trends in 2018. Facebook, for example, is prioritizing video content and LinkedIn is following the same road. Users can understand the message better when it’s in the form of a video. A quality video gets 12 times the shares than blog post and images together. Brands that use video in their social media marketing strategy gain 41% more traffic than those who don’t. 80% of the audience will choose to watch a video over reading a blog post – that’s huge! The stats for live streaming are yet another story. Since 2015, the year that brands were specifically impressed with the idea of live streaming, the use of live streaming started growing really fast. 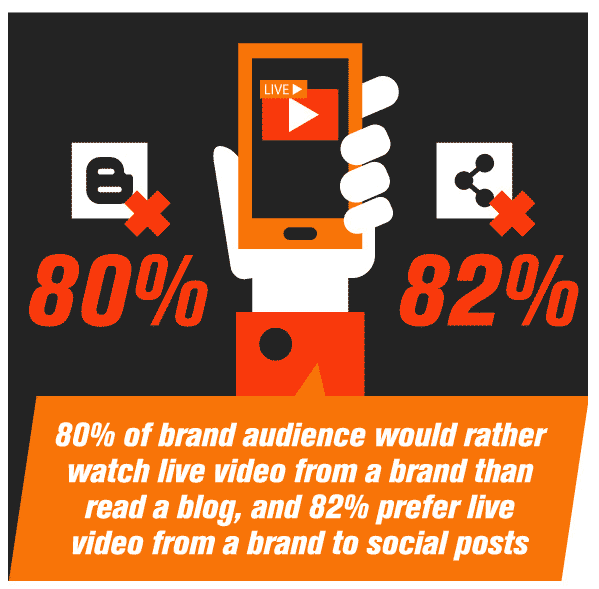 So much so, that it is expected live streaming video traffic to generate 82% of the overall traffic by 2020. 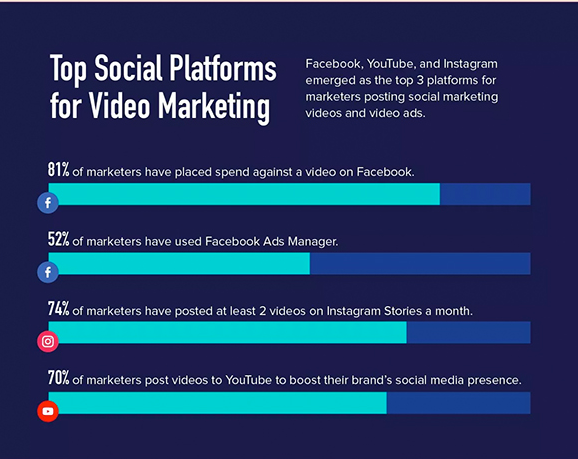 Brands will continue to invest in video advertising, and if you are one of them, you are on the right side of social media marketing strategy. Bottom line – consider revising your social media strategy and adding video and live streaming for increased traffic and conversion rates. Because this is a social media marketing trend that has no intention of disappearing any time soon, as we will see in 2019 social media marketing trends. Chatbots may be the last thing on our list of social media marketing trends of 2018, but they deserve the grand applause. How else would any brand with a wide range of customers be able to satisfy the needs of all of them? Chatbots are nothing new, and brands are using them for years, but in 2018, this became a quite common practice. 80% of the participants like CMO, CEO or sales and marketing executives, said that they are using chatbots or planning to use it by the year 2020. This clearly shows that users are expecting better and faster service from brands. In our fast-paced world, nobody likes waiting, and if a user doesn’t get an answer as soon as possible they will look for it somewhere else. As you can see, 2018 was a challenging year for anyone involved in social media. The social media marketing trends were numerous but keeping an account on all of them is just not possible… or necessary. With the trends is not about implementing every single thing that is new out there, just those important for your business and those that are not likely to go away any time soon and can benefit your business. As a brand, you can’t change the past, but you can definitely prepare yourself for the future. 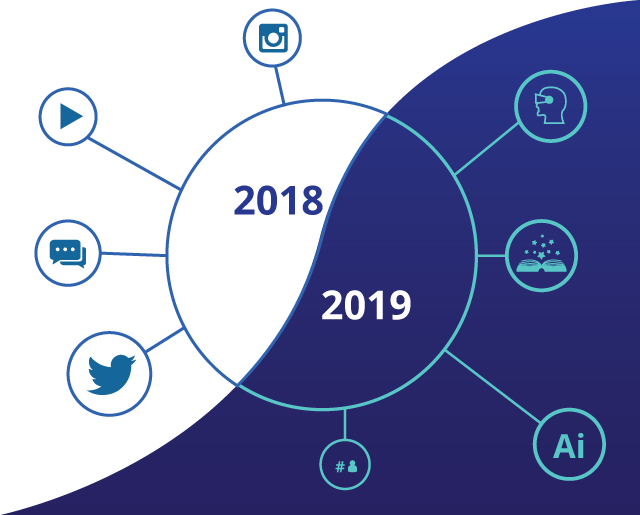 And that’s what we are going to do next – discuss the social media marketing trends for 2019. Well, even though it’s the fourth month of the year, we still have two thirds to go. A lot of what we are going to see in 2019 is in the same ballpark as the social media marketing trends in 2018. A lot of what’s been going on in the previous year will continue to be a trend this year as well. However, most of it is concentrated on taking care of customer’s needs. No matter the brand goals, every company should focus on creating better customer experience on social media. Now, let’s discuss the trends that await us this year. On Facebook only, there are around 60 million business pages. If you are a business, you know how hard it is to get to your users through all that social media noise created from these 60 million businesses. Storytelling is one effective way to fight against this noise and catch the attention of your audience. It started happening a few years back, but in 2019, with all this focus on user needs instead of brand needs – it will grow as fast as bamboo. Tell stories that are relevant to your potential and current customers, not the ones important to your brand. People don’t like to hear how great your brand is – they would love to hear what you can do for them. It’s one of those social media marketing trends that will never be démodé. One of the biggest social media marketing trends in 2019 is people liking brands that have other purposes besides the obvious one – making the big bucks. Because of this, videos that implement a human side of the business have been few steps ahead of its pals – blogs, infographics or sales letters. For example, take a look at this Burger King campaign. Chances are you’ve already seen it, but let’s see it once again. Video Source: BURGER KING | Bullying Jr.
You’ll see that Burger King has been quite strategic about this commercial. And, to quote Tim Nudd, it’s incredibly well branded. Every brand can choose to influence much bigger issues in society. If they choose wisely, it might turn really well for their business. And, as a bonus, you will be able to lift above all the social media noise and engage with your audience on an emotional level. And this is a bond that has great strength. Since we are at the engagement issue, let’s continue with our list of social media marketing trends for 2019. In 2019, the users will want more of the brand’s time. As we previously mentioned, one-to-one communication was on the rise in 2018 and will continue to be a social media marketing trend in 2019. However, instead of trying to outsmart the algorithm of a certain social media platform, trying to satisfy the user’s need is a much better strategy. Plus, it will pay up pretty well in the long run. On the other hand, doing this can be quite time-consuming. And this is where social media tools come in handy. They are not only the best alternative to increase your company’s performance this year, but are also the key to maintaining the relationship with your users. What I mean by that is with social media tools, you can monitor any problems, frustrations, questions, recommendations or ideas that your current or potential customers are having. And, at the end of the day, if any problem occurs, you can contact your users through e-mail or direct message. 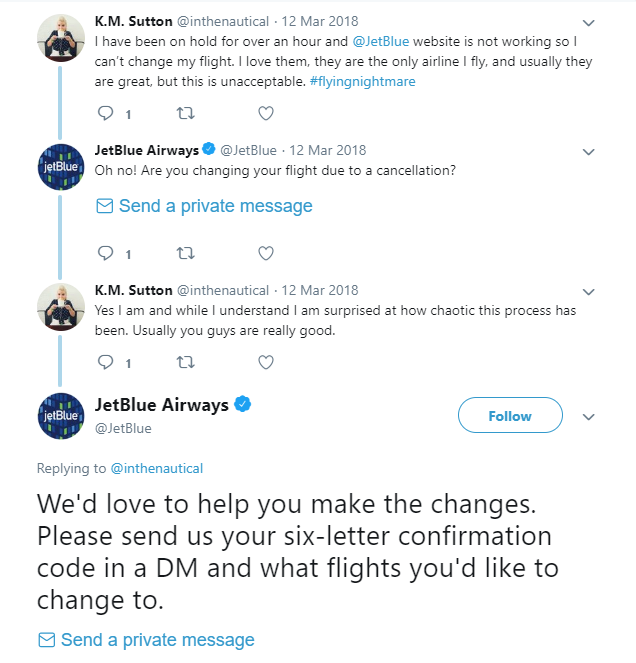 This is how you avoid problems to go social and this is how good customer service should look like. For instance, these two examples are the perfect illustrations how problems can look like on social media, and how a good customer service deals with them (even though our goal is to avoid going social and to take care of any problem in time before it explodes). Let’s take a look. 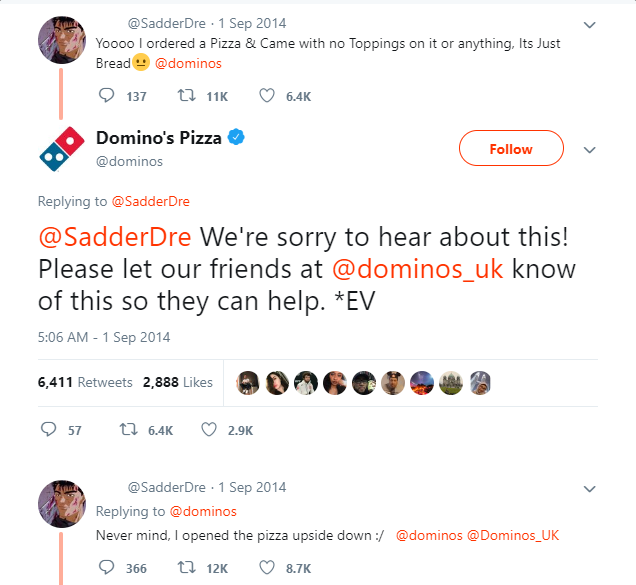 Domino’s, the pizza brand, had this misunderstanding a few years back. But even then, they figured it out through the power of social media, and they handled the situation pretty well. Regardless that this was the customer’s fault, staying professional is the social media marketing trend that will never go out of style. The second example is about a more serious issue than just pizza (please don’t judge us for this statement), but the company manages to handle this just fine. The four-year gap between these two tweets shows that customer support on social media is not something new. But this year, more people will expect excellent customer support, and if your brand likes to stay on top of their game, social media tool is a must. With the right social media tool, you will be able to deliver better service much faster, and there’s not one customer who doesn’t appreciate fast service. This year, the social media marketing trends that are worth considering are the ones that worship the customer, not the brand. A beautiful hand-crafted wooden chair that you saw on that website one time is right there in your own living room. Is it that or just Augmented Reality? It’s the second one, and it’s becoming an even bigger thing this year. A one truly social media marketing trend to stay. In other words, AR is used if you want to see what would you experience if you have that product or try that skirt or have that chair in your home. If you haven’t experienced something like this so far, chances are, this year you will. Those statistics are on the side of AR. 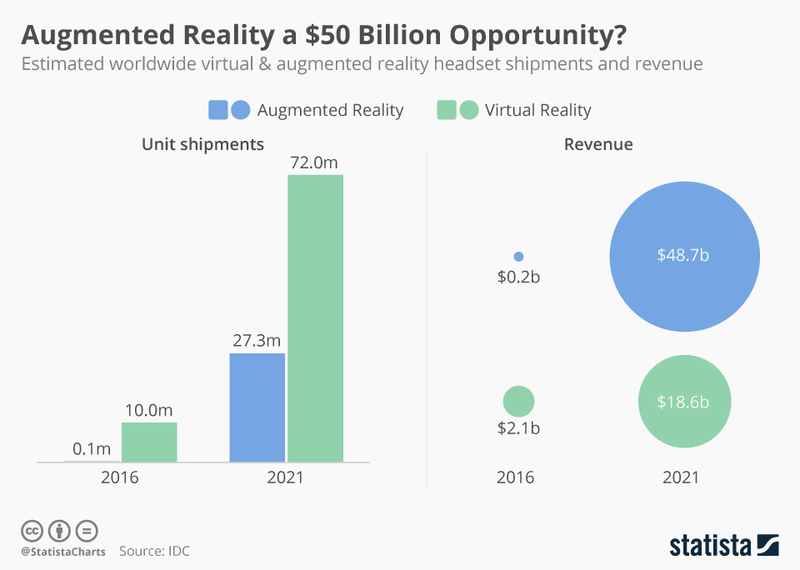 Image Source: Augmented Reality a $50 Billion Opportunity? According to Statista, the AR industry will become so big social media marketing trend by the time we reach 2021, that it will turn into 59 billion dollars industry. With AR, brands can provide a better customer experience. In 2019, more customers will turn to brands that are giving them literally the live experience of a certain product. Yes, customers are buying online, but with AR, that experience can turn out to be more engaging. Plus, AR can make a lot of other things possible on social media for users to – attend a sports match from the comfort of your home or play a video game together with other users, possibilities are endless. And, most importantly, AR is an excellent way of increasing brand awareness. And if you provide a good experience, people will share it and recommend it. All in all, make sure you consider AR when developing your next social media strategy. It’s one social media marketing trend that won’t go out of style any time soon. Yes, in our social media marketing trends of 2018, chatbots were the cherry on top. In 2019, they still are. 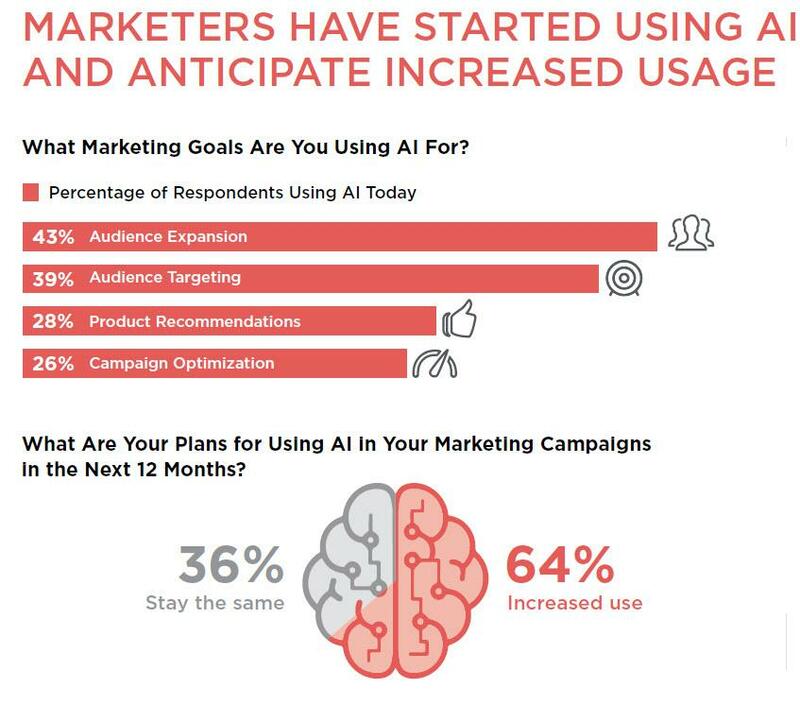 Just for the record, in 2018, 43% of marketers reported that they’ve been using AI as a part of their marketing strategy. And 64% are planning to invest more in AI for their marketing campaign purposes. Many brands are accepting the idea of automating the customer service process. More or less, these automated messages will keep the customer satisfied until your employees can take over. It might not be the perfect customer experience since nothing can replace the human factor, but this is one social media marketing trend that will improve the overall brand experience. Millennials are the one group of customer that accepted chatbots quite nicely. They use social media to interact with their brands via chatbots. Or in other words, as we can see from the numbers above, their habits prompted more businesses to invest in developing AI service. The amount of potential that lies in AI is huge and definitely worth exploring. As the image shows, in the year 2019, the growth of using AI for business purposes will be at its highest so far. And it’s safe to assume this social media marketing trend is here to stay. The statement above has proven true in the past year. 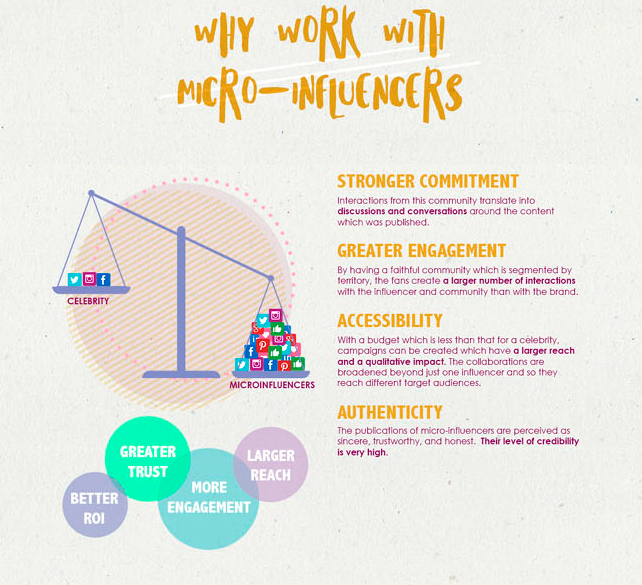 Choosing to work with micro-influencers can turn out to be the right investment for your brand. For starters, micro-influencers have a significant amount of fewer followers on social media. But contrary to the popular influencers who can have millions of irrelevant followers, these people have a well-chosen audience. It’s more convenient for users to trust them rather than a celebrity. Working with micro-influencers can increase the brand’s credibility and users’ trust in the brand. However, most of the brands out there are making one critical mistake when choosing an influencer to represent them – they only see the number of followers. The thinking behind this strategy is, the bigger the number, the bigger the audience. And this is not at all a winning strategy. Let me show you one example of why this strategy is not working every time. 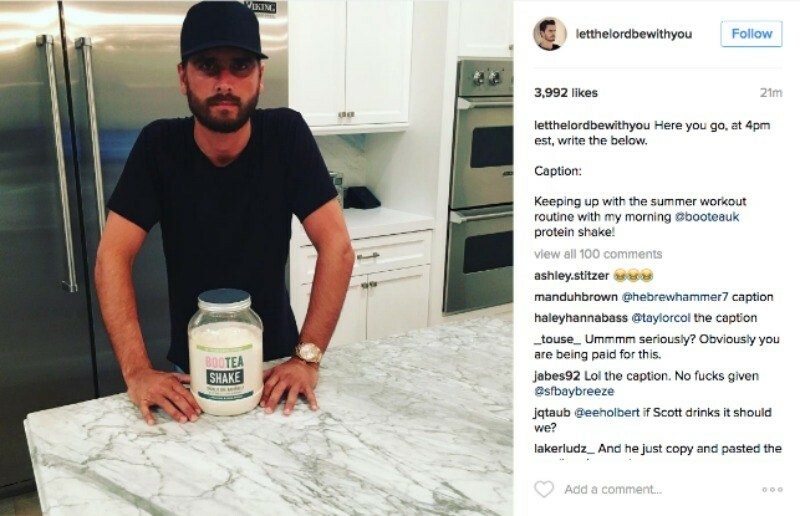 Do you remember the case when Scott Disick posted a photo on Instagram about a protein shake with the caption exactly as the brand required? Of course, this might have been on purpose for the post to gain even bigger social media influence. But even if this is not the case, this is still irresponsible action form the influencer. This and many other embarrassing situations might be the reason why many brands in 2019 will decide to transfer their products to micro-influencers. And this is the end of our list of social media marketing trends for 2019. For sure, this is not a definitive list. As you already know, things on this side (the social media side) change with the speed of light. However, we’ve presented the most important social media marketing trends so far and provided some interesting material to think about this year. If you ever tried to sum up everything that’s been going on on social media for 365 days, you’ll see that’s near to mission impossible. All these social media marketing trends may give you the feeling that you’ve spent 7 years of your life in one. Too many things are going on in so little time and we often end up feeling overwhelmed, and at moments, even powerless when it comes to social media. Yes, it might feel crazy. But, the best thing you can do is to adapt and overcome. In 2018, brands faced several major changes in social media. We had the Cambridge Analytica scandal, the Twitter erasing 70 million accounts and the GDPR regulation. A lot of other things have been going on social media in the previous year. And the Earth got invaded by Chatbots since they are almost everywhere. All of these social media marketing trends have one thing in common – the User. People are becoming more immune to poor social media marketing. They are aware of their value for the brands, and they are asking for full-time best customer experience. This trend, as we can see, is going to continue to happen in 2019 as well. We have the storytelling coming on the big screen once again, and they are here to hit big. Engaging with the audience has never been easier thanks to social media tools. If your brand wants to give the customer experience to remember, they should consider AR. And if any brand wants to gain users trust and their good reputation on social media, AI is a must. Last but not least, 2019 is the year where brands should start choosing their influencers wisely. We can agree that this is a lot to process let alone implement in one year. Hopefully, brands will revise their social media marketing strategies and will put all their eggs into one basket – improving the customer experience. At the end of the day that is one thing that matters the most.